Heat the milk and add the tea and some matcha tea powder for the infusion. In a bowl with the hook, add the flour, sugar and salt. Drain the milk and mix with the yeast. Add the eggs. Mix again and add in the butter. When the dough is ready, cover it and leave it for half an hour. Store the dough in the fridge for an hour. Put the dough into the mould. Prove for an hour and cook the toast bread for an hour. When ready, keep it until it is cold. Boil some water and add the tea. Cover for a few minutes. Take some soft butter (or cream cheese) and the tea and put into the cutter machine. When the butter (or cream cheese) is ready, use a drainer. No need to have leaves. For assemble, it is up to your choice. 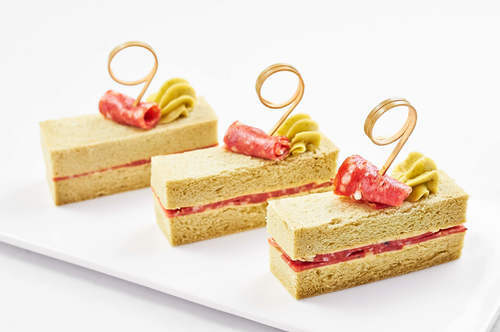 For suggestions, you may use the green tea cream cheese for salmon sandwich or green tea butter for all charcuteries.